A study from Columbia University found that on average, most people are stalled by more than 70 decisions a day. Every day. All across the land, marketers are crafting plans designed to persuade, cajole and coax their target audiences to experience this sentiment or to take that action. After all, the art of influence is a key part of our arsenal; we understand the levers that can be pulled and the dials that can be turned to help shape the decision-making process. 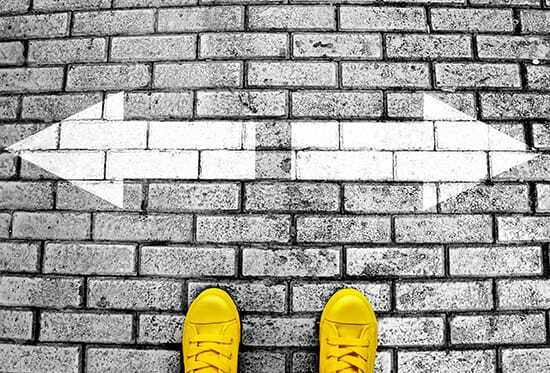 While we are (rightly) focused on the factors that influence the decisions made by our customers and prospective customers, are we applying similar levels of thought to how we arrive at our own choices? When formulating marketing strategies, are we interrogating our own decision-making processes enough? Before approaching the decision itself, it’s essential to understand the parameters of what’s in front of you. How urgent is it? How much does it matter? Does it have implications for anything or anybody else? What are the potential consequences? Can they be undone? Decisions about where to invest your life savings and what to have for lunch are very different but, more to the point, they don’t (or certainly shouldn’t) carry equal importance so some perspective is needed. The trusty Pareto Principle tells us that 80% of our rewards will be generated by just 20% of our efforts – at the same time warning that 80% of our efforts will deliver a return of just 20%. This ratio provides a sound, simple framework for evaluating and prioritising your decision-making. Using Pareto Analysis, you are left with a clearer sense of the 20% of decisions that deserve 80% of your time and attention. In a data-driven world, it’s easy to dismiss or devalue your gut feelings as irrational, unstructured thought bombs. But those mid-shower, flashbulb moments of enlightenment can reveal true genius. Unconscious thought theory (UTT) puts forward the idea that our unconscious mind is actually better at solving complex tasks than conscious thought. As such, there is an argument for giving ourselves the time and space to review, digest and incubate ideas rather than press for an immediate solution – I’m sure we’ve all felt the discomfort of being trapped in a brainstorm meeting that has long-since flatlined. With a little more patience and more consideration for the power of our unconscious minds, we should trust that our intellect, experience and understanding will all culminate in that unscheduled ‘Eureka!’ moment. Perhaps most important of all is to learn and understand the biases that, unbeknown to us, influence our decision-making processes. In recent years, marketers have become increasingly aware of the risk of unconscious bias, particularly on issues around diversity and inclusivity. There is also now a louder conversation around cognitive biases – the broad range of effects, laws and fallacies that, unless we know more about them, threaten to impair the clarity of our thinking. To keep ourselves more in line, perhaps the answer is to infuse our thinking more with the spirit of the challenging/inquisitive toddler, perpetually asking ‘why?’. Taking the time openly question and honestly answer questions about what is driving us, as marketers, to follow a certain strategy or use a particular approach can give us new perspectives and inspire fresh thinking. Maybe chucking in two or three juicy ‘but why?’ interruptions into every marketing meeting is the way to ensure campaigns have more impact and to achieve marketing greatness. Who knows? We’ll let you decide. While it may feel counterintuitive, making more decisions (about your decisions) could be the key to sailing through those 70 decisions a day, and getting others to do the same for your brands and products.